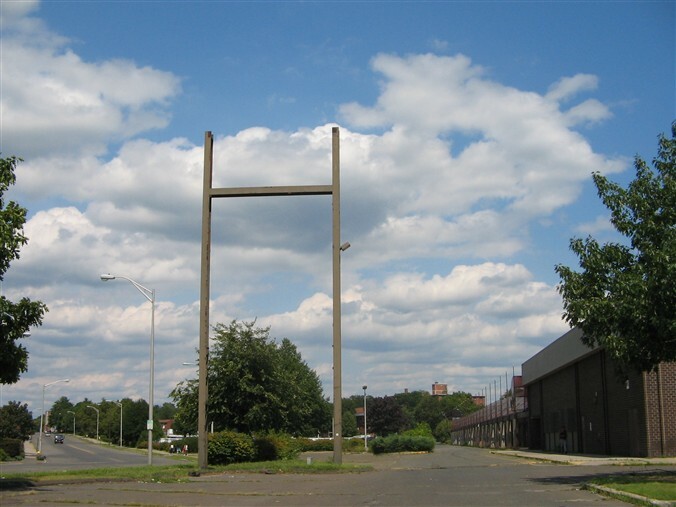 The Meriden Mall eluded radar in large part because of its name; because the larger Meriden Square Mall is often referred to as the “Meriden Mall,” I assumed references to this mall were in fact referring to the other, larger mall. In fact, Meriden Mall was the city’s first mall, opening as a quarter-million-square-foot center in 1970. 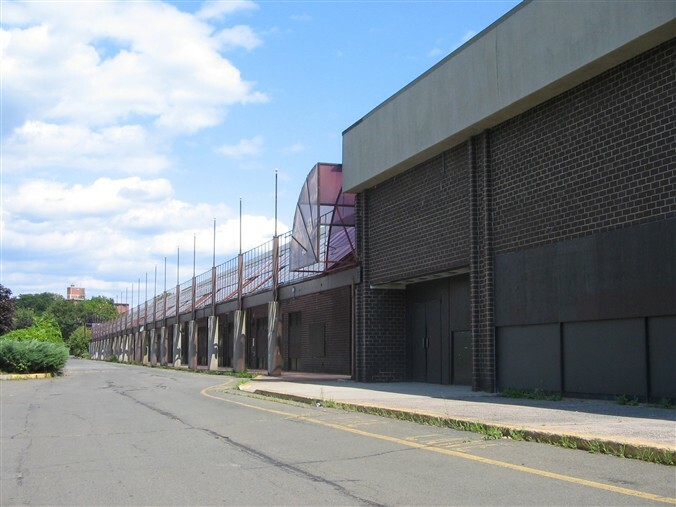 Anchored by WT Grant’s, Stop & Shop Supermarket, a twin cinema, and a Walgreens, the Meriden Mall was the area’s first enclosed shopping mall. That would not be the case for long, as the larger Meriden Square Mall would open barely more than a mile away in 1971. As a result, the Meriden Mall, which was perched on the edge of Meriden’s downtown area, would never truly gain its footing. Connecticut is the wealthiest state in the United States, but its urban areas are notoriously troubled, and Meriden is no exception. With the decline in the area’s silver manufacturing industry in the second half of the 20th century, Meriden’s economy suffered and the city itself has never truly recovered. 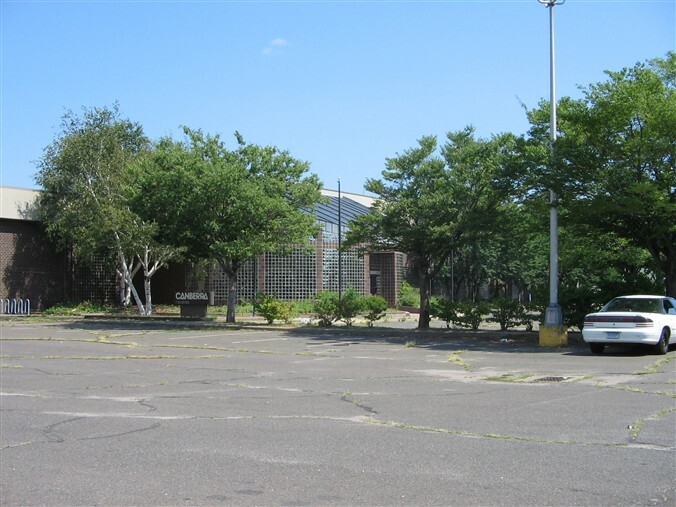 The Meriden Mall today is surrounded by many empty, historic brick buildings from the downtown area on one side, and a large, sprawling post-war style public housing project on the other. It is not exactly an inspiring backdrop. Meriden Mall attempted to compete with Meriden Square for some time as the city experienced this decline in the 1970s and 1980s, but it was simply too small and poorly located. WT Grant’s went bankrupt in 1975, and their space would be filled briefly a few years later by local discount department store Barker’s, who also would last in the space for only a few years. The Meriden Mall was renamed “Meriden Hub” to address the same awkward naming issue that caused my own confusion, but this didn’t seem to make much difference. The Stop & Shop store left the center in the early 1990s, effectively killing its viability as a retail center. It did briefly serve as the home of a company called Canberra Industries–whose signage still remains, as you can see in these photos–but they’ve long since left the property due to its tendency to experience severe floods. I haven’t been able to pin down an exact date on which the mall closed, but I was able to discover that “Sal’s Barber Shop,” a tenant at the center from the time it opened, didn’t shut until June 30, 2003. The city council minutes from whence I drew this factoid state that barber Saolo F. Sforza was one of the first tenants to move into the mall in September 1970, and will be (would have been?) one of the last tenants when his barbership closes. 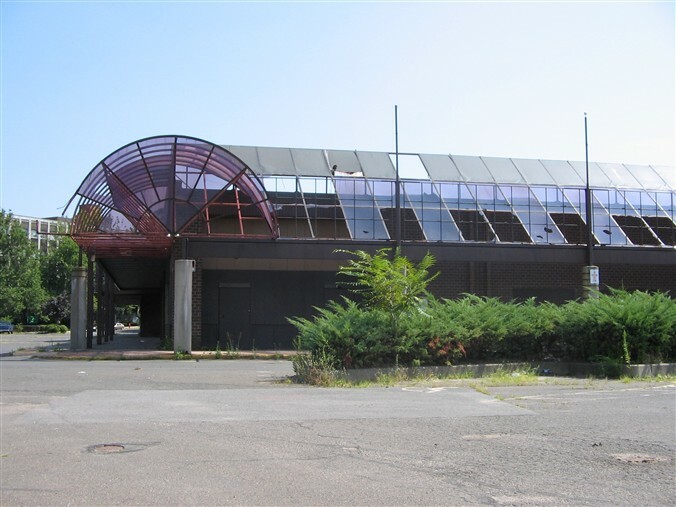 The city of Meriden took the blighted parcel by eminent domain in the fall of 2005. They plan to demolish the mall using funds authorized by Governor Rell and build a park and flood control area in its place. 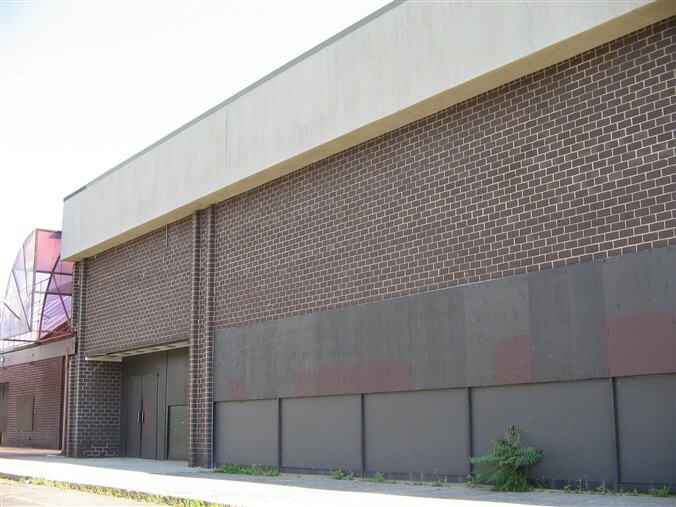 In some ways, the story mirrors that of the Bristol Centre Mall in Bristol, Connecticut, another hardscrabble Connecticut town who tried to change their fortunes by demolishing part of their downtown and building a small enclosed mall in the 1960s/70s. 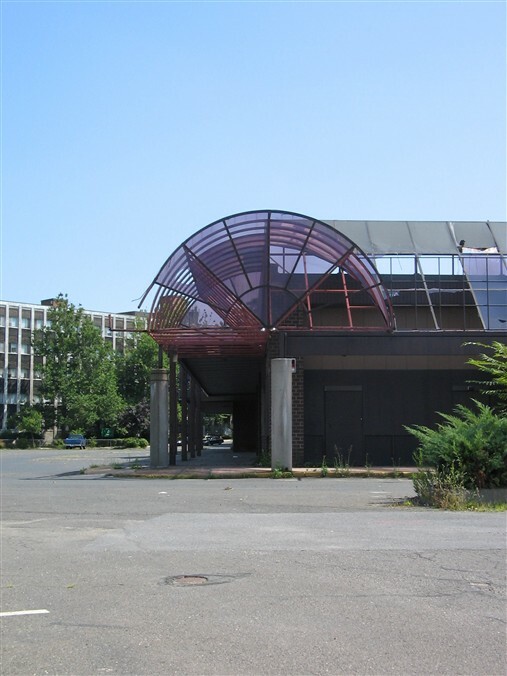 The city of Bristol also took the Bristol Centre Mall by eminent domain and is also in the process of shuttering and demolishing the last remains of Bristol Centre to reclaim the long-underused land for the city. In a Labelscar first, these pictures were all taken TODAY, August 6, 2005. You can also find some more on the city of Meriden’s webpage, including some really fuzzy interior photos! That place looks like a bomb hit it, especially with all the broken glass. W.T. Grant didn’t last into the ’80s as stated. It actually went out of business in 1975 and was the biggest US retail bankruptcy of its time. Oh, thanks for the detail! I had always wondered when WT Grant officially went out of business. They anchored the space that later became the JCPenney at my hometown mall (which wasn’t enclosed until 1984, but the main portion of the structure was much older) and I’ve never been able to figure out exactly when Grant’s left and JCPenney opened. This at least fills in part of the puzzle, probably. Hi! Great site! Just to be specific, the W.T. Grant store at the Meriden Mall (later “Hub”) was actually a “Grant City,” which was W.T. Grant’s answer to Kresge’s “K-Mart” and Woolworth’s “Woolco.” The store also had a Tagway Shoe Store located there as well. Walgreen’s actually had a sit-down (booth and counter) restaurant located there as well. Walgreen’s had a few sit down restaurants. I remembered the Walgreen’s restaurant at the Winter Haven (FL) mall. If I remember correctly, there was a restaurant in the G. Fox store at Meriden Square Mall. My sister insists it was inside JC Penney’s. Since your name is G. Fox Fan, I figured I’d ask. And yes, the Walgreens in this mall in downtown had a restaurant counter, similar in size to what you’d find in a Kresge’s. But my all-time favorite store restaurants were the Bradford Room at WT Grant’s and the K-Mart restaurant on Route 5 (Broad Street) in Wallingford. When did I shop there? like 3 years old or something? It looks vaguely familiar probably one of those malls I haven’t been in a lot. There were also 2 banks on the property. One was CBT which was swallowed up in the crazy bank mergers of the early 90s. It was closed and torn down. the other bank,HUB was still there a year ago but with little business. Are you the same Jon Martin I worked with at SNET? A buddy of mine just informed me today that this mall was completely demolished. I remember when I was a kid (in the early 90s) going with my dad to Big S Liquors, then located at the Meriden Hub. It was a scary place back then. Good riddance. I’ve got the demolition photos taken last month. Once I stop being lazy, I’ll do an update with the pictures. From a suburbanite point of view, the place is rather hideous like the rest of urban-decayed Meriden (though the mountains and canyons areas are beautiful). I like the old landscaping on the parking lot,I hope they didn’t uproot the trees,they’re the nicest part of the place.. I used to work at the W T Grant store in this mall in 1972 through 1973. The store manager in 1973 was also the nephew of the CEO of the company. Nice guy and very competent. Just shows you the top brass don’t always look after their nephews! 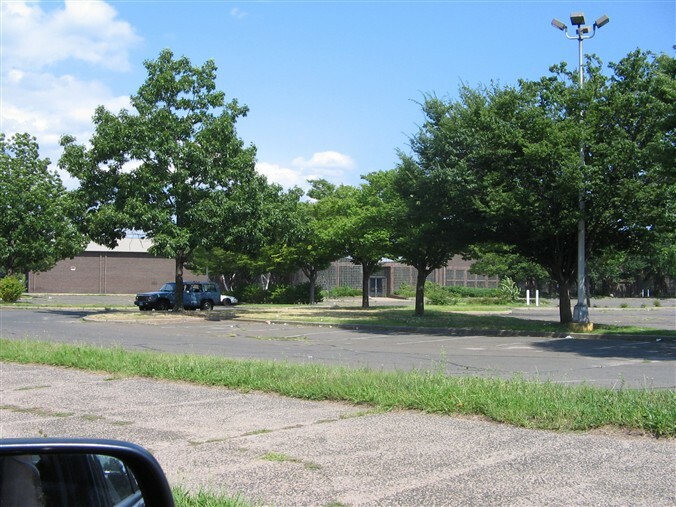 When I was in Meriden taking photographs for cinematour.com a few years ago I stumbled upon this building. I had no idea what it was, but it seemed intriguing so I explored around the outside – and still had no idea what it was even after exploring! It looked like it should have been shops, but it wasn’t. Well, as of today now I know what it was! Pretty cool site. Found it surfing for pictures of Meriden, my hometown actually. One thing that was not reported is that there was a liquor store in the plaza that would serve to anyone with two arms and two legs. One of the people interviewed mentioned a movie theater. Did this mall ever have a movie theater? I actually don’t work too far from this former mall (I work in Wallingford — the next town over) and it’s just a big grass field now with a landscaped parking lot. But Wa-Wah Kitchen is still across the street. Was that liquor store Big S Liquor, Meriden Thug Life? If that was the name of the store, it is still there on the same block as Wa-Wah Kitchen. That area surrounding the mall, with the train station, The Mills projects, and the side opposite the train station is pretty much the same as when the mall was there. Only the mall is just a big field, except that the grass in the area that was the mall grows in a slightly different pattern. The main thing different about the area is a building next to the train station, which is now an insurance agency. It has the framework of a bank, with a drive through teller booth that is now blocked by a dumpster. Perhaps, was this the old main office for Canberra Industries? Wow. Never saw this place, the “Meriden Mall” we would go to every now and then when I was a kid was actually the larger one. Anyone know exactly where this place was located (like, street name or nearby buildings)? I grew up in Meriden (born in the late 70’s) but I can’t figure out whether I’ve ever seen this place before. Also, I think some of the commenters here are being way too harsh on my poor old hometown, regarding the “urban decay” and scariness. It is actually quite a suburban place, and besides the projects most of it is safe and lovely (but then few towns have nice projects). I promise that you can safely exit your car nearly anywhere in Meriden without dying or being accosted- the crime rate is a 3 on the national scale (1 to 10), which is exactly average and possibly a little low for a town of its population. I think part of the problem is that there is a predominant stereotype of every place in CT either being “olde New England” or “wealthy, white, and upscale”. So, when they are confronted with a completely average working town, they think it’s a dump by comparison. I still visit Meriden regularly to see my parents, and would move back in a heartbeat… but sadly my job keeps me chained elsewhere. However, if you want some **real** urban decay and fearing for your life, check out Bridgeport! @Tammy Wikowski, This building was on the corner of east main and pratt streets, right before the train tracks. That building didn’t come down till about 10 or less years ago. It sat between State St and Pratt Street. Meriden is a bit more haggered than when I was a kid (1963), but I bought my house here, my kids are flurishing at Wilcox, and I couldn’t have picked a better place (in CT) to raise my Family. How times zip by. I lived in Meriden until 1983 or so, and as a kid I watched the Meriden Mall being built. Took plenty of pictures of the construction, too. I would walk the construction site regularly, and was only occasionally chased off the property. I not only saw this place being built, I was there on opening night. For 1970, this was a pretty cool place even though crudely designed and cheaply built. By 1973 or so I found myself working at the Stop and Shop supermarket, located at the north end of this mall. The store was used primarily by low-income residents of nearby Mills Apartment projects, and suffered theft losses that got so bad, the Stop and Shop company closed the store several years before its 10-year lease ran out. There was a “Meriden Twin” theater in this mall, one storefront south of where the Stop and Shop was located. I can still remember the construction workers using blue chalk snap line to mark the locations of the auditorium seats! Meriden Mall won’t be missed. It was a product of the times, lousy political “leaders,” and poor economic planning. 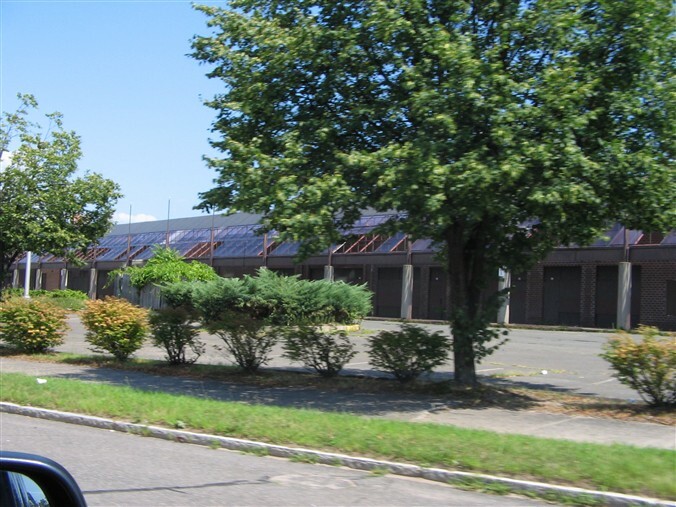 The Meriden Mall was located on the lot bodered by East Main, Pratt, Mill and State Streets. If you are driving west on East Main you would pass it just before you get to the railroad tracks. There were a couple of banks right on East Main. The mall or Hub was directly behind. I remember when this place opened when I was a kid. There was a big fountain in the main concourse that went through the middle of the mall. A good indication of the problems to come was during the first month or so when some of the idiots from the projects went in to the grocery store, bought or stole a couple of bottles of dish soap and poured them into the fountain. Foamy bubbles everywhere! The old business saying is “location, location location!” With the Mill Project next door, this was a loser from the start. Very sad story about the Meriden Mall. I worked there in 1973-1974, in Grants. There was a Chinese restaurant there called The China Yum which we used to frequent after work. Two old Italian guys had a by-the-slice pizzaria and an Orange Julius franchise opened up also. Anderson Little had a store at the north end of the mall. “Rob” mentioned that he worked there the same time I did and remembered the store manager, Pete. There were a lot of good people working at Grants back then and it was a shock to learn that the whole corporation went bankrupt a year or so after I left. 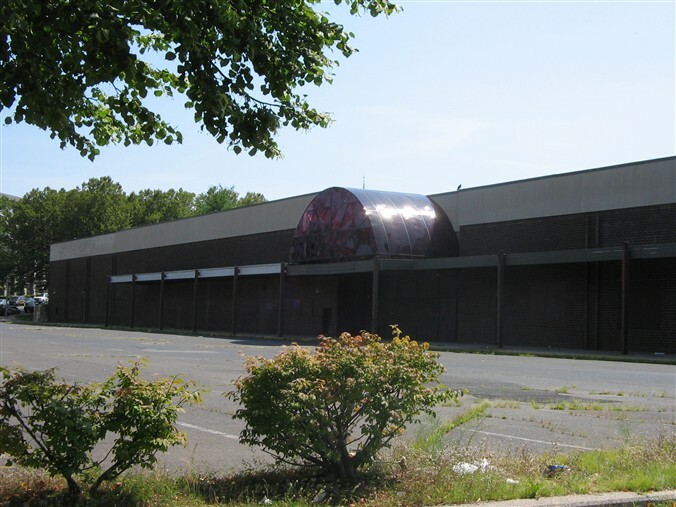 From what I heard, the thing that really spelled the end for the Meriden Mall was the opening of the Off Track Betting parlor in the mall. When that happened, every bum, wino, derelict, and sleasebag started hanging out in the mall all day. Families stopped going there and it just died. When I went back for a visit some years later, the mall was closed and some sort of business was using the building more as an industrial park. But at least the Jay Bee deli was still on the corner! Where the Mills is now and the NE corner of the Hub lot, was a street called Stone Street. My French Canadian “memere” lived there. Was a French area……….. I do remember Walgreens had a sit down restaurant. (eating there was a big deal for us at that time) We were eating there once and a girl reached in thru the plants and tried to steal my mothers pocket book. I worked at Grants from 73-74 as well…..probably with Fred as a management trainee for Pete Zimmerman……it was a pretty busy place back then but did suffer from the Meriden Square which had opened in 71 and was much bigger……but we had some good times….especially at Kenny Yums restaurant after work…..
Are you the Bob Whitworth that was once married to the New Haven Register reporter named Anne? Correct, back in the 80s and early 90s. An OTB will kill just about anything it gets near – except for a liquor store. What if the liquor store is tasteful and awesome, not some cheerless and drab place frequented by drunkards? I grew up in Meriden and that as the place I used to shop at when I was young, in the 90s. I remember in the 80s, they had a video store my mom and dad used to go to. They also had Brooks, Chinese Restaurant, Laundromat and a Pawn Shop during the 90s. It wasn’t a beautiful place at all, but it had plenty of people still shopping there. Used to go here in the early 1970’s with my mother, sister when visiting my grandmother who lived up off East Main Street. This mall was rather shabby then and like other commentators have written, OTB brought out the low-lifes. Many years later I wound up working off Butler Street just a few blocks over and would frequent the Chinese/Puerto Rican restaurant in this strip mall, Wa-Wa Kitchen. You’ve never had such delicious Chinese & Puerto Rican food; they’d cook it in the same fryer combining the two flavors!